We've already seen cockroaches turned into unwitting puppets for human overlords, but never have we seen dominance quite so casual as with Brittany Ransom's recent Twitter Roach art project. While part of the exhibition, one of the insects wore a modified RoboRoach backpack with an Arduino add-on that took commands from Twitter: mentions including specific hashtags steered the roach left or right by stimulating its nerves. Yes, that meant the poor roach rarely had the dignity of seeing its master face to face, although there's some consolation in knowing that it wore the backpack for limited periods and had a required 30-second pause between instructions. As to why Twitter Roach came to be? Ransom tells CNET she imagined the currently dormant project as a reflection of the "overstimulation" us humans encounter in a digital world. We can certainly sympathize given our livelihoods, although its existence makes us nervous about 2013. If we're fighting off remote-controlled insect armies a year from now, we'll have to admit we had fair warning. Sometimes the plays on words are unavoidable -- in fact, they form the very heart of Scott Garner's recent musical creation. 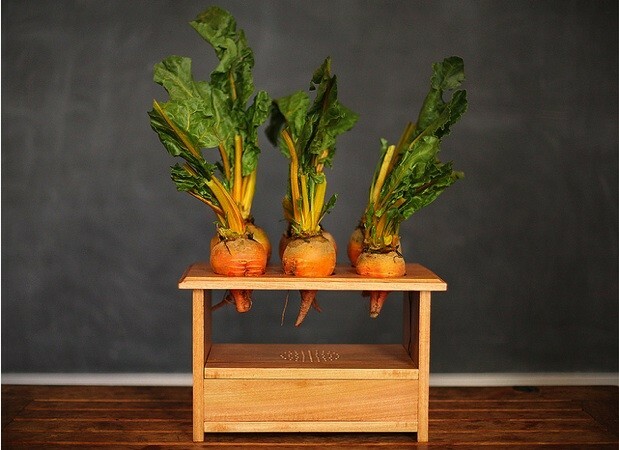 His BeetBox turns six of its namesake root vegetables into drum pads through SparkFun capacitive touch sensors, all of which are controlled by (what else?) a Raspberry Pi. Cleverness goes beyond the core technology and food jokes, as well. All of the circuitry and audio equipment is hidden within the wood box, making it look more like a horticultural project than machinery. We don't mind the lack of production plans when there's source code available; we're mostly curious as to what in our garden would make for a good rhythm section. 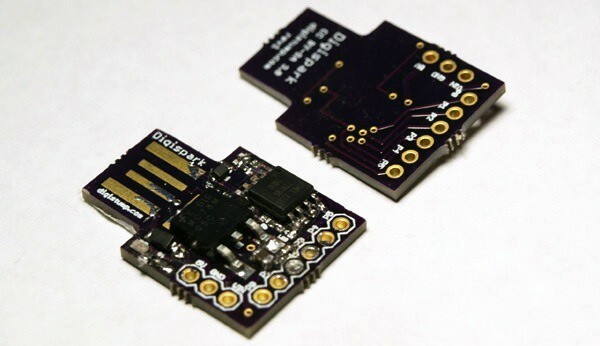 End-of-year engineering school projects often pique our interest for their creativity. It's not every day that they can carry a bassline, however. 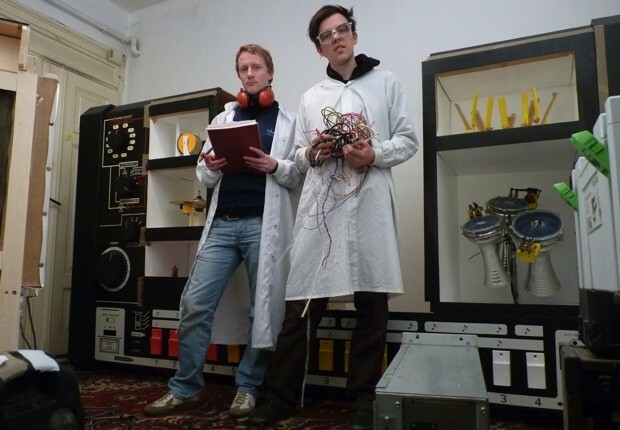 James McVay's robot project for his honors year at the Victoria University of Wellington, the supremely well-named MechBass, wouldn't have much trouble keeping up with a favorite band. It centers on a custom, Arduino-compatible board that controls the plucking, fretting and damping of four strings to faithfully recreate bass guitar sounds from MIDI input. The design even accounts for the unwanted noises of actuators and motors, while virtually everything was either 3D-printed or laser-cut just for the task at hand. Sounds good? There's more in the pipeline: an upcoming Swivel robot will experiment with different playing techniques, and McVay ultimately sees his work teaching us about robotic music's interaction with human performers. For now, we'll be happy with the video after the break and hope that MechBass takes requests. As one might imagine, there's plenty of shiny things to get excited about in BeatBots' San Francisco office, one of which is suspended on a wall in between paintings of Keepon and his power-promoting British cousin, Zingy. Marek Michalowski gave us a look at the still-unnamed wall drawing robot he's been fiddling around with. 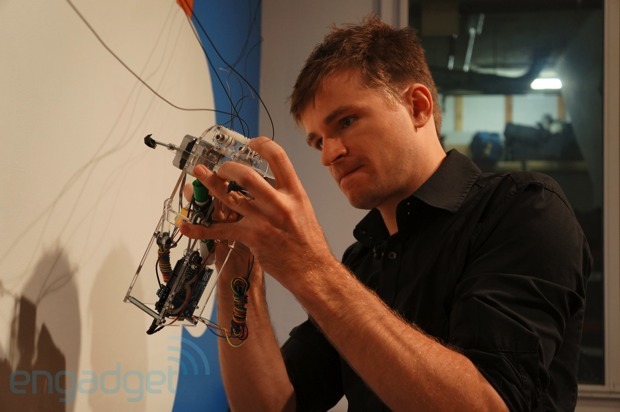 Still in its early stages, the 'bot is supported by wires that also power it, using an Arduino brain to drag a dry erase marker across the white surface of the wall. Check out a quick video explanation after the break. We've all had that moment where we sit in front of the keyboard and have trouble just getting started. It can be an especially dire problem when the 30-day deadline of National Novel Writing Month (NaNoWriMo) looms overhead, and that was enough for inventor Steve Hoefer to craft his own USB progress meter. 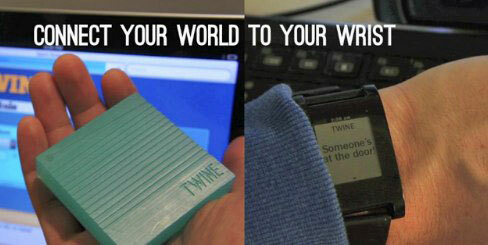 The Arduino-based contraption advances a real-world dial or gauge as the word count reaches the NaNoWriMo servers, giving that extra incentive to meet a daily goal or hit the ultimate 50,000-word mark on time. 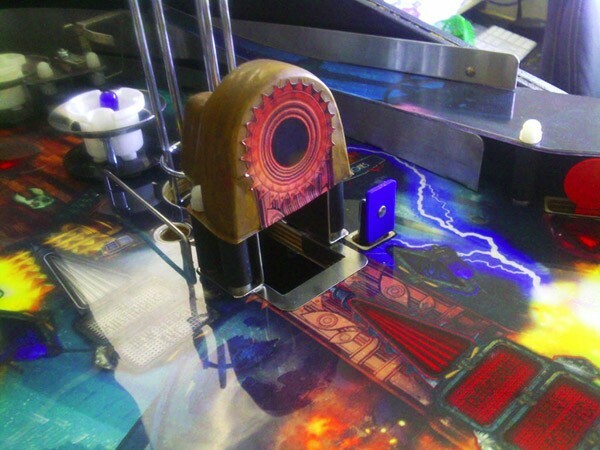 Hoefer characterizes it as a simple project for those who know their way around an Arduino controller; the toughest part for them may just be constructing the box that keeps the meter presentable. Full instructions are available after the break, although we'd hurry to build the meter before November starts. It could all too easily be the source of the very procrastination we're trying to avoid. 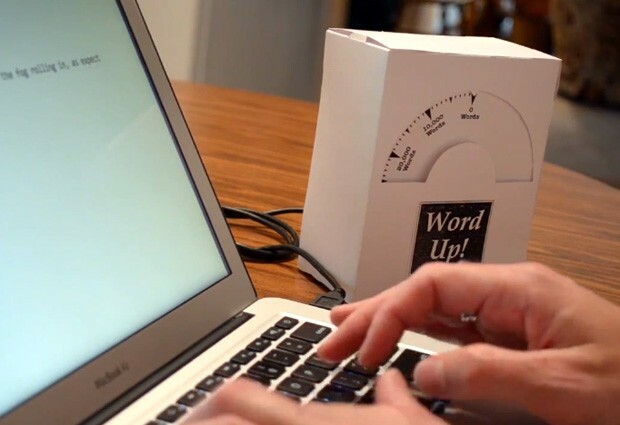 NaNoWriMo progress meter uses Arduino to fight writer's block, may be its own distraction (video) originally appeared on Engadget on Thu, 25 Oct 2012 14:34:00 EST. Please see our terms for use of feeds. We've seen quite a few NES mods in our day, but we can't say we've ever seen one hooked up to anything quite like this. 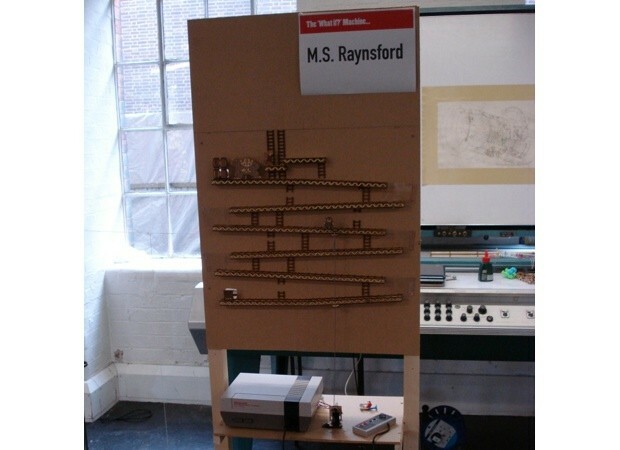 Built by DIY-er Martin Raynsford, this contraption / work-of-art makes use of an Arduino (naturally) to relay signals from the NES controller to the Donkey Kong screen brought to life above, which was constructed with near pixel-perfect accuracy out of laser-cut parts. As Raynsford points out, though, things are still a bit limited in the game's V1 state. There isn't much of an actual "game," for starters -- just Mario stuck in the middle with a never-ending loop of barrels / ball bearings that you can jump over. A second version is planned with a greater degree of control, but we're guessing the video for it won't be quite as hypnotic as the one after the break. Mechanical Donkey Kong game tests your barrel-jumping skills, patience originally appeared on Engadget on Mon, 24 Sep 2012 19:11:00 EST. Please see our terms for use of feeds.